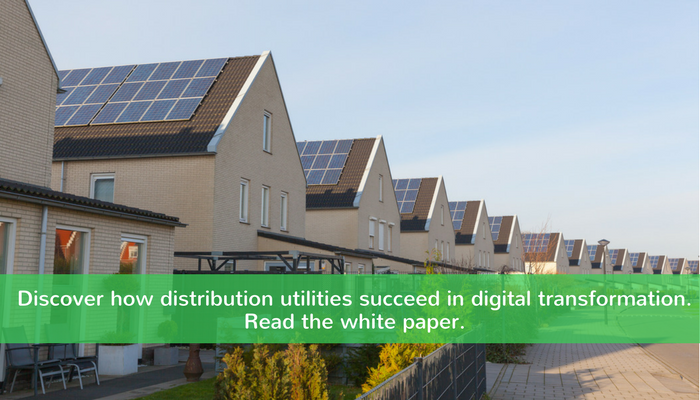 What’s propelling distribution utilities to digitize, decarbonize, and decentralize their business? For an overview of the situation, let’s look at eight crucial change drivers. One of the biggest game changers of the 21st century for distribution utilities is the shift toward decentralized energy production and dispersal. It has required an entire business model adjustment. For example, the influx of renewable energy and DER to the grid affects everything from infrastructure to pricing to distribution. What’s the result of this move to decentralized energy? Utilities have an improved way to access more reliable, resilient and flexible energy with reduced transmission losses while meeting consumers’ ever increasing demand for more energy. Innovations and technological advancements have created a new type of energy consumer. Empowered customers have a long list of expectations that includes increased control over and visibility into their energy consumption, demand for more competitive pricing, desire for the increased use of renewables, and the ability to act as a prosumer. Utilities should recognize this as an opportunity to jump-start change initiatives and build off technology they already have in place, like smart meters, to increase ROI. Moving to a digitized smart grid is a huge step toward reducing blackouts and other technical risks. New embedded, automated controls allow for continuous monitoring with real-time information for operators and improve network resiliency, safety, and efficiency. This allows utilities to prevent and address issues before they become a crisis. Distribution utilities are transitioning to a more digitized energy world with greater automation, but with that comes increased cyber security concerns. Grid cyber security is a crucial risk management issue and it’s essential that utilities devise a security plan that identifies threats, risks, and vulnerabilities and finds solutions to mitigate them in order to protect their network and assets. Challengers are coming from all sides to compete in the utility market. Renewable energy, in particular, is disrupting the landscape and bringing new players, such as third-party providers of products like photovoltaics for the residential markets. One of the biggest threats to utilities is their own customers, who are bypassing or supplementing traditional energy with alternatives like solar, microgrids, and self generation. For example, on average in the U.S., a solar project will be installed every four minutes and the rate is only expected to increase worldwide. Utilities must focus on innovation, efficiency, and services while also keeping their prices to compete. Consumers’ needs and desires are changing, particularly the growing demand for cleaner energy, distributed energy resources, and renewable energy. To meet these, utilities must invest in upgrading infrastructure and technology, which is forcing an adjustment to their cost-revenue and business model. 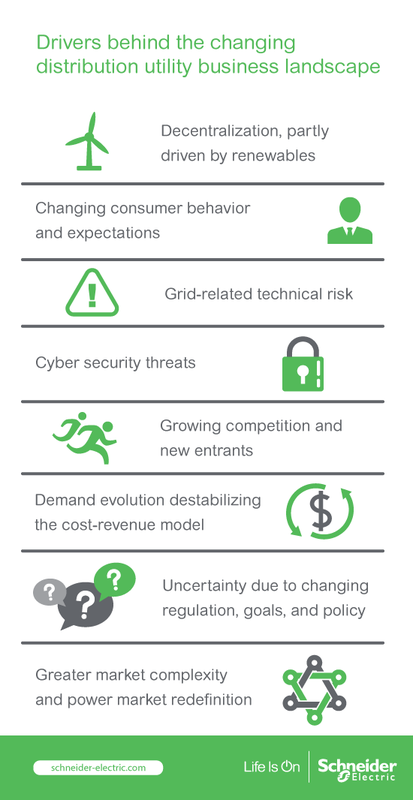 Realigning with the demands of this developing market will allow utilities to enhance performance, so while it may mean changes to the traditional cost-revenue model, it also allows creates an innovative new model focused around emerging capabilities to prepare for growth and success. Worldwide, energy legislation is in a state of flux. Regulations differ by country and region but the overall push is for a dramatic improvement in sustainability, reduction in CO2 and increased use of renewable energy to meet ambitious goals like those set forth in the Paris Agreement and the 2020 EU Climate and Energy Package. The energy market is no longer focused around the straightforward business of selling and delivering energy through central-station power plants. Instead, for a number of reasons, utilities are being thrust into new situations that force them to juggle traditional delivery methods with a changing infrastructure that includes the addition of variable renewables such as wind and solar, DER, demand response and self-generation. This all adds complexity, but is undoubtedly where the market is, and has for some time, been headed. Utilities can pull away from the competition by leading the energy transition and providing a cleaner, more flexible and reliable grid.